Granted, a simple kiss in private would have been damning enough to necessitate their marriage, of course, and a hasty marriage at that, lest the young lady’s reputation be left in tatters. Hell, the mere fact that Gabriel had removed her from the main path was all that was required to bring about their imminent marriage in short order. The fact remained that leaving her reputation shredded to bits in such a circumstance was exactly what the ton would have expected of Gabriel or either of his siblings. There was little wonder all the gossipmongers’ tongues constantly wagged about them, calling them those devilish Devalles—a moniker they’d come about quite honestly. No one would ever accuse their sister, Amelia, of being a prim and proper young lady, and both Luke and Gabriel had done a fair bit more than was considered acceptable for a gentleman sowing his wild oats before settling down to become a respectable member of Society. The fact that Gabriel had readily done the right thing by the chit, despite having only known her for two days to that point, had taken the beau monde by surprise. Needless to say, everyone and his cousin had accepted the invitation to the betrothal ball, which Mother had insisted Luke must give in Gabriel and Miranda’s honor. The revelers wanted to bask in Miranda’s downfall, yet they would soon be disappointed that they must instead be relegated to witnessing only Gabriel’s fall. Luke’s one and only brother was, to be plain, thoroughly besotted with his intended. Luke had never imagined he’d see Gabriel in such a state, fully head over ears in love with the girl. That discovery had made it much easier to stomach doing as Mother had insisted when he would rather spend the evening holed up in some gaming hell or another. In general, he preferred to avoid doing anything that might lead to Mother thinking he agreed with her or thought she was right. If not for the fact that they needed someone to oversee Amelia during the Season, someone who could chaperone her at balls and accompany her to the various other outings a debutante must attend, Luke would banish his mother to some distant estate and wish her to the devil. Lord knew she wished all of her offspring to that very same devil on a daily basis and had done so ever since the day Father died, as though they had been responsible for taking him away from her. How could his children have had anything to do with him going off to spend time with his mistress, for God’s sake? Luke thought that responsibility ought to rest on his mother’s shoulders, not his own. Yet, she somehow blamed them for the fact that Father’s carriage had hit an icy patch of road on his way home in the dark and had flipped over and killed him. But that was neither here nor there. Their guests were certain to be disappointed when they departed in the wee hours in the morning, as Luke was sure nothing even remotely scandalous would take place at this ball. Further, he had no intention of falling prey to the elder Miss Hunt’s attempts to ensnare him. Miranda had already personally given him the same warning Gabriel was now relaying. His remark earned him a wicked smile from his brother. “Care to make a wager on that?” Gabriel drawled. “No, but neither do I underestimate Samantha Hunt’s desperation. Nor her willingness to go to extreme lengths to get what she wants, for that matter.” Gabriel took another draw from his whiskey, eyeing the woman in question. Luke followed his brother’s gaze and found Miss Hunt staring straight at him with a determined gleam in her eye. He had to admit that Gabriel had a point—the young lady seemed decisively undeterred. But she’d yet to attempt anything, and he had the advantage in that he already knew her aim. Gambling had been Luke’s preferred vice for almost ten years—ever since their father’s death when Luke had inherited both the earldom and the care of the family. He hadn’t been ready for either of those obligations, and yet they’d been his whether he’d wanted them or not, and his they remained to this day. He’d taken to his duties as well as anyone could expect of a young man, then a mere twenty years old, but he’d needed an occasional distraction from familial responsibilities and pressures the earldom afforded him. The gaming hells had provided that distraction for him. Though gambling had been responsible for earning him a rather healthy reputation as a ne’er-do-well, it had also given him that much needed freedom from the less enticing aspects of his life, however temporary the respite might be. “What sort of wager did you have in mind?” Luke asked, never removing his eyes from the vexing elder sister of his brother’s intended bride. “We have a deal, although I’m afraid you’ll be emptying your pockets. Are you ready to open the dancing with your lady, then?” Without waiting for his brother to respond, Luke caught the eye of the lead violinist of his hired string quartet and gave a nod. He made his way across the ballroom to the two sisters, his brother close behind him, as the first strains of a country dance filled the cavernous space. She might have plans to entrap him, but that didn’t mean he could ignore his responsibilities to her family. 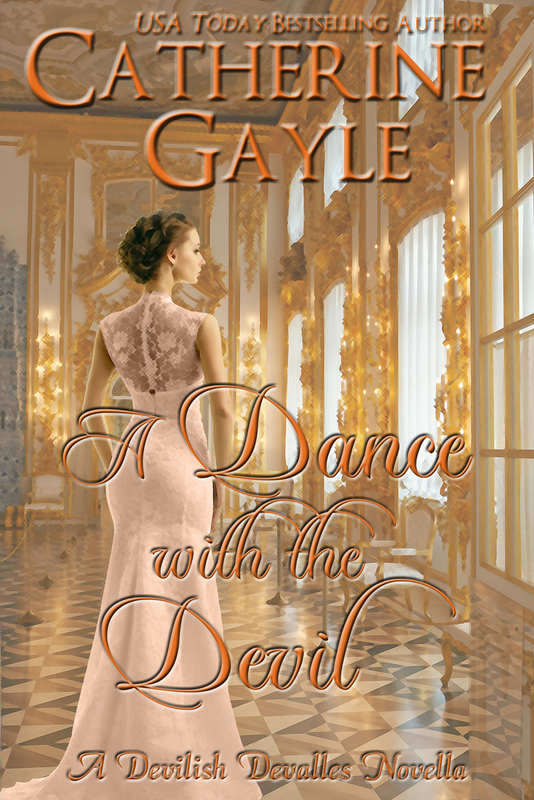 Gabriel was claiming a dance with Miranda even as Miss Hunt’s eyes glimmered with a devilry that made him think she belonged in the Devalle family more so than her sister. Not that he intended to let her have her way. Gabriel might be ready to settle down and become a respectable gent, but there was no rush for Luke to follow in those same footsteps—even if he must someday wed and beget an heir. He could take his time and find the perfect lady to become his countess. With that, he led her out to the center of his ballroom and took up his place alongside his brother. All the while, he watched as Miss Hunt’s eyes scanned every corner of the grand room, though for what she was searching, he did not know. She might be a devious little thing, but he was a Devalle. Perhaps tonight he would give her a lesson in what it means to truly behave devilishly. It would be on his terms, however.